^ a b "Sky News wins RTS News Channel Of The Year and the Breaking News award". 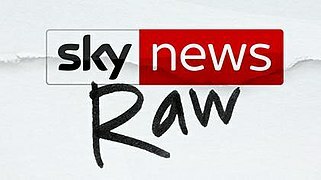 Sky News. Retrieved 2018-03-02. ^ "Money: Personal finance news, advice & information". The Telegraph. Telegraph.co.uk. 2016-02-16. Retrieved 22 September 2016. 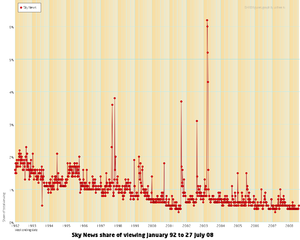 ^ "100 Complaints after Sky News Outs Twitter Troll Later Found Dead iMediaEthics". Imediaethics.org. 2014-10-12. Retrieved 22 September 2016. ^ Jason Deans. "Sky News reporter quits over bogus Iraq story | Media". The Guardian. Retrieved 2016-12-21. ^ Wells, Matt (July 21, 2003). "The backfiring missile". The Guardian. London. Retrieved 2008-10-11. ^ "UK | War reporter found dead". BBC News. 2003-10-06. Retrieved 2016-12-21. ^ "Sky fined £50,000 over war report". BBC News. December 16, 2003. Retrieved 2008-10-11. ^ "Barbatul care a inlesnit intalnirea dintre jurnalistii Sky News si presupusii traficanti de arme: Am fost pacalit, mi-au spus ca este un documentar". 2016-08-10. Retrieved 10 August 2016. ^ Day, Matthew (2016-08-19). "Romanian investigators accuse British journalists of fabricating arms trading investigation". The Telegraph. Retrieved 27 October 2016. ^ "RTS Television Journalism Awards 2018 - The Results • News Coverage". TV Newsroom. 2018-02-28. Retrieved 2018-03-02.